Yesterday was the last monday of the Kartika maasa. This is considered an auspicious day for the worship of lord Shiva. 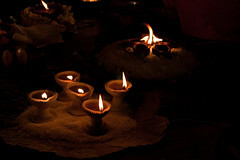 Temples usually arrange for people to bring as many oil lamps as possible and light them during the evening. This is called "Laksha Deepotsava". I thought this would be a good opportunity to get some pictures in dark settings. I went to a temple fairly early - by 6:30pm. People were still gathering and I knew this was going to get busy here real soon, with lot more people pouring in. One disappointing thing was, the temple had bright halogen lamps everywhere! I had not expected this. I wanted to shoot with only the light from the hundreds of lamps around. This was a bit of a dampner. But, I managed to scout a couple of not-so-bright places and take some pictures. You can see one of those with the post here. Also, this was the first photoshoot after I decided to shoot RAW instead of JPEGs. I had fun processing the RAW images and also learnt the flexibility that RAW photos have to offer. Once a JPEG is edited, the quality and valuable information is lost. Whereas with RAW images, you can apply any processing and export images to JPEG/TIFF. The original RAW image has not changed and can be processed differently again. Also, the camera always produces RAW format. If the camera is set to produce JPEGs, it has to process the RAW data into a JPEG image on the basis of settings like saturation, hue, white balance, etc. Usually, this processing is better done on a computer than what's done by the camera. All the more reasons to shoot in RAW mode. Only drawback is the large size of the RAW images - you'll need more card capacity to shoot the same number of images. Also, the rate of capture might be lesser than JPEGs when shooting in burst mode. Now waiting for an opportunity to shoot in daylight to see more advantages of a RAW image.